Pippi Hornsby: Who are we? Where are we going? That was the title of the first ever piece of work I had to produce for my MA. I’ve spoken about it before; the small poster project that was meant to relay our reasons for choosing to do our respective MAs, the anguish it gave me to try to sum up myself succinctly, and the fear I had of presenting my achievements to the group. I saw myself as two distinct halves – the engineering side, full of technical accomplishments and project management successes, and the art side, which was taught out of me when I took on the giants of physics and maths. I see now that in that first project I never really answered the question. This question asks me about my future, and the crux of my being. It doesn’t ask me about my achievements or the certificates on my wall; it asks ‘what are you about?’ It’s not your practical skills, it’s your passions. At the time, I felt defined by my CV. I had spent 4 years studying how to be a logical, accurate thinker and what felt like a logical progression to me (engineering to design) seemed hard to justify to others – I was afraid of my future, I had no idea where I was going. 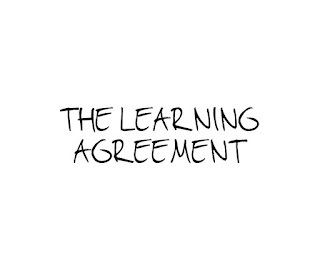 I have to sign a Learning Agreement. It’s essentially a contract written by myself that outlines what I will be doing for my Final Major Project, but it is my chance to fully represent myself – to explore the concepts that define what I want to do, and showcase them. So I find myself again asking these two questions, only now I have a duty to myself to answer them.